Thanks to Mike Sweeney from Nashoba Valley, we now know of this small area that operated in Hubbardston. In talking to one of Nashoba's lift mechanics, Mike learned that there was an upside down ski area, with parking at the top. The truck that ran the lift is apparently still there, as is the lodge. The area is in the Pine Crest section of Hubbardston. Dates of operation are unknown. The vertical drop is less than 100', and it appears that the area was one wide slope. 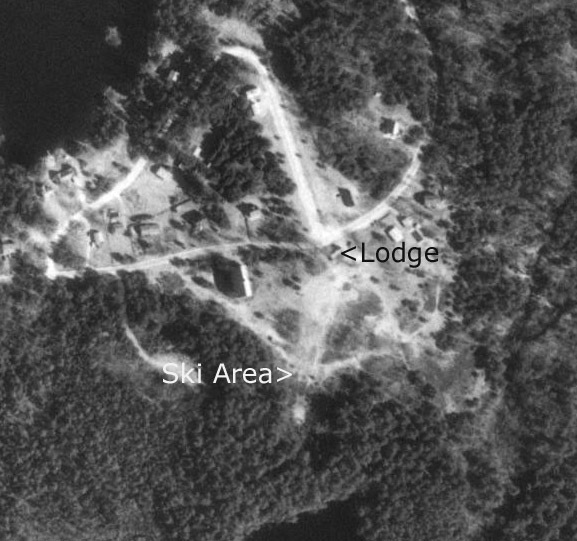 An aerial view of the ski area is shown on the right, with the lodge being at the top of the ski area. If you remember this ski area, and have more information, please let me know.